Summer has officially come to an end. Overall, I believe it was a GREAT summer for our family. We had lots of fun, even with spending 3 weeks at Children’s Memorial for Ally to get her trach. It is really a positive change in her life and we are so happy we decided to do this pro-actively so that she can handle illnesses better, plus now she always has a stable airway. She started to act a little “off” a week ago with some mucus plugging, probably a cold. Amazingly, she has been handling it very well though once we clear her out during her regular treatments. It is so different and easier for her and us. I pray this continues since a cold usually meant a collapsed lung and hospitalization without her trach. She is almost back to her new baseline and is spending 30 minutes (or more) off her ventilator about twice a day. Today we got official permission to go to 45 minutes off (breathing on her own). What’s strange is that I really don’t mind if she is off or on since there are pros to both. A big pro to her trach and ventilator is that she can vocalize so much more and is louder. She also has more energy and can sit up more. A pro to being off the ventilator is being able to move around easier and less tubing when we hold her, but we can work around tubes if she is more comfortable. We will continue to adjust and try new things with Ally. The newest is a new start to the school year!!!!! The girls started school this week and seem to all really like it. Kristyn is at Lane Tech as a freshman and is a varsity cheerleader. Melissa is in 1st grade with a super teacher and excited about reading. Ally is in Pre 4 at Stock with all new teachers for special ed and blended with a very caring aide, her home nurses, and me (for now). Be sure to check out the beginning of the school year pics and also some from our end of summer outings. Some highlights include: Brookfield Zoo, MDA Golf Outing, MDA Labor Day Telethon, Disney Princesses on Ice…. The 2010 MDA Brookfield Zoo Walk is VERY quickly approaching on Saturday, September 25th. It is from about 7:30/8 am till about 10:30 am. Zoo admission and parking is free with your donation and fundraising! We would LOVE to have you on the Ally’s Angels Team! I need to know ASAP if you will be joining us and your t-shirt size(s). Please email me or call today!!!!! tina@angelally.com or 773-283-7211. I must let the MDA know our tentative team for their planning ASAP. If you have a zoo membership, I also need your number so that the MDA is not charged by the zoo for you and your family. This way more $$$ can be raised as we work towards a CURE for SMA and other muscular dystrophies. We are also looking for companies to sponsor the Ally’s Angels Team. With a donation of $150 or more (by Sept 15th), they will also be on the back of our team shirts. 1) Official MDA walk t-shirts will only be issued to each person who raises $74 or more. This funds 1 minute of research and provides many things for families affected. I know this can be hard to do as a family, so please donate or raise what you can and still join us, PLEASE. My main goal is to have a HUGE team walking in honor of Ally. 2) Angel Ally t-shirts are available for a $5 donation (sizes 2T to 3XL) and will have a new picture of Ally on the front in black and white and will be ash gray. I am also going to find out about sweatshirts, so let me know if you are interested. We usually wear the t-shirts at the walk, but since they have been a big hit and everyone wants one, we will be taking orders in advance. If you are walking, it is optional if you wear an Ally shirt or not. Please submit all orders and sizes directly to Tina 773-283-7211 or Sandi 847-875-5304 by Sept. 15th. We may be able to place orders after the event too, so feel free to contact us if you would like to order a shirt. We will put the next order in by Oct. 1st. Please make checks payable in advance to Angel Allyson Fund, NFP. Mail directly to Sandi or Tina Krajewski (3614 N. New England, Chicago, IL 60634). We do two walks each year (0ne for MDA and one for Families of SMA). I understand economic times are tough, but if you are able to join us and/or make even a small donation in honor of Ally, it means the world to us. Every $1, $5… $20, $100… is one step closer to a cure and treatment. 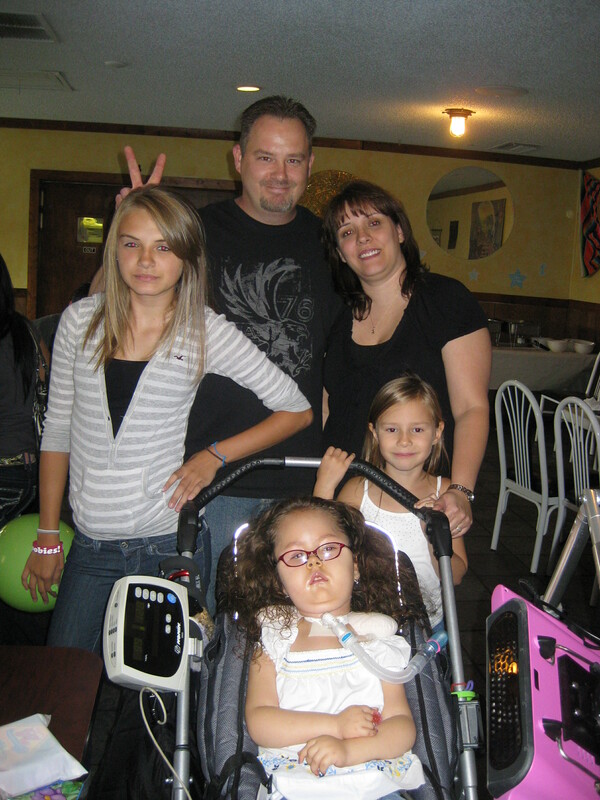 I sincerely hope that you’ll take the opportunity to support Ally, her friends and the MDA. If you have any questions, please don’t hesitate to call or e-mail me. Thank you again for your past and continued support to Ally and our family!!! !